This 1960's Retro inspired HUS-EL196-HU Coca-Cola Mini Fridge combines the iconic glass contour bottle with the wording 'Things go better with Coke'. The Mini Fridge features an adjustable thermostat that keeps your food and drinks ready on demand, whilst achieving an A+ energy rating. It's compact size ensures that it will look great in any room of the house. 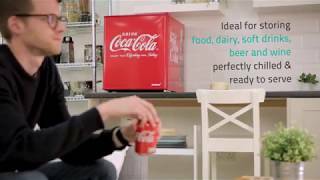 Yet it is also capable of holding 40 cans of your favourite drink and is food and dairy safe, making it ideal for students or anyone living in a smaller space.